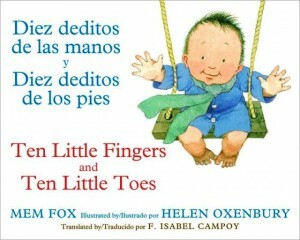 There are many wonderful counting books for children, but very few that teach tolerance, emphasize the comfort of sameness, and pull on the heart strings at the same time like author Mem Fox’s adorable board book, Ten Little Fingers and Ten Little Toes. “There was one little baby who was born far away. These simple words and the passages that follow show young readers that though babies may be born in different countries and cultures and may look different in dress and color of skin, they still have things in common that make them sweetly human. This is a sturdy, toddler-sized board book that has something for everybody. Ms. Fox’s text, soft and pure, offers sweet innocence, the joy of lives beginning, and the unique beauty of the mother-child love. Artist Helen Oxenbury’s exquisite illustrations are the perfect complement to the text, showcasing round-cheeked babies of every race that mature from infancy to bouncing toddlerhood right before the reader’s eyes, all while experiencing the wonder of new friendships, the joy of belonging, and the simple appreciation of being loved. Unfortunately, not every baby is born with ten little fingers and ten little toes. Critiques may complain that this book fails to acknowledge certain physical exceptions, like the absence/abnormality of fingers and toes, and therefore may be offensive to those not born as “whole” as the book emphasizes. But if parents take a second look, they may find that this simple little board book is also keenly multifaceted, and the concepts of “counting” and “normalcy” are only two of several themes. The sweetly repetitive language delivered with just the right amount of parental love emphasizes a larger concept: similarity by virtue of the simple state of being human. Ten Little Fingers and Ten Little Toes is the perfect read for quiet time, bedtime, or lap time and can be read for the sheer comfort and security it offers, or as a preschool introduction to social studies, geography, and/or multiculturalism.